What will a pool cost me? A swimming pool in your own home is one of life’s little luxuries – or possibly a very large luxury – so it is never going to be cheap. This article will give you some estimates for some of the more usual types of pool. The fact of the matter is however that there is such a large range of styles and types of pool on the market that the range of prices is probably greater than you’d expect, and certainly larger than we can go into here. An above-ground pool can be tackled as a DIY project so that sits down at the bottom end of the price range. An indoor, heated pool for year-round use is going to involve the work of professional contractors and possibly architects. To dive into the deep end of a bespoke, top of the range indoor pool you are going to need deep pockets. If you have a specific type of pool in mind, use the contact button to the right and we will try and answer all your questions. An in-ground pool price estimate. An outdoor pool of a size that would suit the average family, which is heated and has a cover, will have a starting price of around £35,000 . That is a pool that is in-ground and nicely finished but not one that is ticking every luxury box. 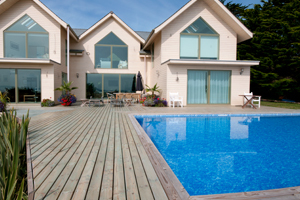 It should be said that the site you choose for your pool may also affect the cost enormously. Excavation can be harder (and therefore more costly) in some areas and it won’t always be possible to use the earth dug out of your pool to landscape the site. Issues with difficult access or sloping ground will also push this ballpark estimate up. Enclosing your pool will mean that you can get much more return in terms of pool use from your investment. The enclosure will keep the pool warmer and you will be using fewer chemicals to keep the water clean. But it will also mean that you have to make a bigger initial investment. A pool enclosure is going to come in at an average budget of £8,000 for a 3.5 meter by 7.5 meter pool. The cost of swimming indoors. If you have a pool that is either attached to your house or in its own separate pool room then you have the luxury of swimming whenever you want, 365 days a year. That year-round pleasure comes at a price and a medium sized, heated and air-conditioned pool in its own building is going to start at £40,000. If you are connecting that pool building to your house then the cost is going to rise. A few figures for an above-ground pool. If simply being able to swim in your own garden on a hot summer’s day is what you are seeking then a DIY, above-ground pool is the way forward. For a few hundred pounds and a bit of hard work you can achieve your goal. A few thousand pounds spent will mean that a specialist contractor builds the pool for you and that it’s big enough to invite the neighbours around as well. The least cost to the environment. Swimming pools have traditionally been all about concrete and chlorine, bikinis and barbecues. Times and tastes change and certainly top of the range pools have become more influenced by elegance and style and less evocative of Hollywood excess. The next step on that journey is the eco-pool; a natural swimming pool, sometimes called a swimming pond. Salt can replace chlorine and natural curves and forms can replace geometric designs. It is even possible to do away with chemicals altogether and purify the water using plants and plankton. A principle, however, isn’t a principle until it costs you something and having the best eco-credentials in the swimming pool market means that prices for those pools start at around £60,000. Location, style, shape and level of luxury are just a few of the things that will influence the cost of your pool. The good thing is that the answer to your question ‘What will a pool cost me?’ is anything from a couple of thousand pounds to a couple of million. A swimming pool is about fun and fitness, swimming for your health or cooling off on a hot summer’s day. It is no longer exclusively for the rich and famous but, if you have the budget, it can bring a Saint Tropez lifestyle to your own British property. We hope this article has helped you get some idea of what a swimming pool might cost you but we would be happy to answer more specific questions or help you get in touch with a pool provider in your area. You’ll find other articles on this site that will help you make some of the choices that will influence the cost of your pool so go ahead, dive in.